YTL Land & Development Bhd, the property arm of YTL Corp Bhd, will push ahead with the launch of the last phase of its Pantai Hillpark development in Kuala Lumpur next year despite the global financial crisis. Dubbed Pantai Peak, the RM500-million project features a 16-ha gated community, which will be located on YTL Land's final parcel of land in Pantai Hillpark. It is set to be the latest icon in the area, with 233 units of luxury three-storey hillside semi-detached homes and bungalows with a variety of layouts and design options. Deputy managing director Datuk Yeoh Seok Kian said each home will be priced from RM2 million. "It will come with a lap pool and a stunning panoramic view of the Gasing green belt and the entire Petaling Jaya landscape" Yeoh told Business Times in an interview in Kuala Lumpur recently. The main board-listed developer is optimistic that the property market will improve as banks revise their base lending rate from 6.75 per cent per year to 6.50 per cent per year this month. This is following Bank Negara Malaysia's recent downward revision of the Overnight Policy Rate by 25 basis points to 3.25 per cent to uplift the country's economic activity. "It will boost the sector as bank loans will be cheaper for home buyers. While we are more liberal than Singapore, we have to internationalise our properties." YTL Land, which has locked-in sales of RM100 million from its Sentul East project in Kuala Lumpur, expects its financial performance to remain flat this year due to fewer launches than the previous year. For the 12 months to June 30 2008, it posted a net profit of RM10.3 million and revenue of RM336.1 million. "We had lesser launches due to the US-led subprime crises. We hope America will clean up the mess so that there will be a quick chance of recovery. If the prices of petrol and interest rates can remain low, we will be able to recover fast," Yeoh said. Meanwhile, YTL Land will pace itself with the market for new launches at its on-going 120ha Sentul East and Sentul West project, and 48ha Lake Edge project in Puchong, to ride out the current crisis. "We will continue to introduce high-end products. Malaysia has not gone through a bubble like that in the US, the UK and Singapore. 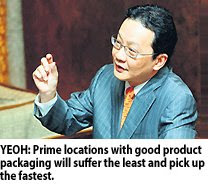 Prime locations with good product packaging will suffer the least and pick up the fastest," he said. Yeoh said Malaysian properties are still more competitive than those in Singapore and Hong Kong. "People with money should buy properties but selectively, to hedge against inflation," he said. Hot property areas in the Klang Valley remain in Sri Hartamas, Mont' Kiara, Damansara Heights, Bangsar, Sentul, Taman Seputeh and the Kuala Lumpur City Centre area. IREKA Corp Bhd, which has over RM500 million worth of construction jobs in hand in Sabah and the Klang Valley, is preparing to work on new projects next year including in Vietnam. Its associate firm, London-listed Aseana Properties Ltd, is finalising the master layout plan for approval for a 32ha seafront resort and residential development in Kota Kinabalu, Sabah, worth more than US$200 million (RM728 million). The project will be developed in two phases, which involve building villas, a hotel and resort homes, executive director Lai Voon Hon said. "We are currently working on the submission of plans and will assess the market conditions before launching this project," he told Business Times. In Vietnam, Aseana has plans to launch seven property projects in Ho Chi Minh City, Hanoi and Danang worth a combined US$2 billion (RM7.28 billion). It has submitted development plans for most of the projects to the local authorities in Vietnam for approvals. Lai said it expects to launch by next year Queen's Place and Hi-Tech Healthcare Park, worth a combined US$650 million (RM2.36 billion), in Ho Chi Minh City. Queen's Place will comprise twin residential towers, offices, serviced apartments and retail space. Other projects in the pipeline are Wall Street Centre, Nam Khang Resort & Residences and One Saigon. In addition, Aseana's stake in Nam Long Corp, Vietnam's leading property developer with over 500ha under its belt, will hold water. Lai said through the partnership, Aseana expects to co-develop at least four property projects in Ho Chi Minh City and in neighbouring provinces. There is currently a shortage of housing in Ho Chi Minh City and Hanoi, which are attracting Malaysian developers such as WCT Engineering Bhd, SP Setia Bhd and Bina Puri Holdings Bhd to those areas. Prices of high-end residential condominiums in Ho Chi Minh City remain high at US$1,500 (RM5,460) to US$4,000 (RM14,560) per sq m, while Grade A office rental rates reflect an upward momentum. Demand is growing but there is tight supply. People's Committee of Long An Province in Ho Chi Minh City vice-chairman Nguyen Thanh Nguyen said Vietnam is opening its doors to foreign investors for infrastructure and building works in the country. "Foreign direct investments in Vietnam has grown from US$20 billion (RM72.8 billion) last year to US$60 billion (RM218.4 billion) year to-date. Our local and foreign banks are lending. We have a few Malaysian firms looking for investments here now," he told Business Times via email. 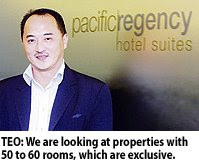 PACIFIC Regency Hotels & Resorts Sdn Bhd, the hospitality arm of Pan Global Bhd, is looking to expand its hospitality business, particularly into boutique hotels. The group, which operates the Pacific Regency Hotel Suites on Jalan P. Ramlee, Kuala Lumpur, is keen to own and operate hotels on islands off the east coast of Peninsular Malaysia. "We set up Pacific Regency Hotels & Resorts earlier this year to manage new and upcoming projects. We are now looking for small boutique hotels on islands in the east coast to buy and manage," its general manager Kenny Teo said in an interview with Business Times. Teo said that it was keen on taking over existing properties to grow the business faster. "We are looking at properties with 50 to 60 rooms, which are exclusive," he said. These properties would be able to offer an average room rate (ARR) of RM1,000 to RM1,500 per night. Teo said that earliest possible date when this plan may materialise is in 2010. Meanwhile, Teo has put in place strategies to help its existing 153-suite Pacific Regency ride through a possibly trying times in 2009. Based on the current scenario, the hotel hopes to be able to increase its ARR by about 20 per cent in 2009. It expects to finish 2008 at an ARR of RM245 per night and an average occupancy of 85 per cent. "We are not worried about our occupancy (in 2009). We have no reason why it will not fill up ... we are more concerned about the rates," he said, saying that competition would get stiffer in terms of rates if the impact of the worsening economy hits Malaysia further. Up to 70 per cent of the hotel's business comes from the corporate market, mainly from France, Italy, Australia and the UK. For next year, the hotel plans to tap into the Scandinavian countries, Spain and Portugal as well as the Asian market including Indonesia and Thailand. Pacific Regency will also look at locking in more long-term guests. This group now makes up 30 per cent of its room inventory. Pacific Regency is like a serviced apartment in its set-up of rooms and offers a fully-equipped kitchen. At the same time, it offers the services like in a hotel including laundry, food and beverage outlets and room services. Teo said that creating awareness of the brand has been a challenge even though the hotel is a homegrown brand and 14 years old. PROPERTY developer Bandar Raya Development Bhd (BRDB) is tipped to sign a deal with a foreign firm to sell a residential tower at its RM2 billion CapSquare integrated development in Kuala Lumpur. It is understood that the buyer is from the Middle East, who is looking to acquire Six CapSquare. It is one of two residential towers at the CapSquare development. The other is known as CapSquare Residences, which has been constructed. The two parties are negotiating on the price, but are expected to conclude a deal by the first quarter of next year, a source told Business Times. "Based on the estimated purchase price and size of the 36-storey tower (featuring 170 exclusive units), the deal may equate to a value of RM600 to RM700 per sq ft," the source said. BRDB chief executive officer Datuk Jagan Sabapathy declined to comment, except to say that the company has been talking to people for one of its condominium blocks at CapSquare. "But we have not finalised any deal yet. We are still in talks on several matters," Jagan said. CapSquare, located between the city's Golden Triangle and central business districts, is a 6.1ha freehold project with 3.8 million sq ft of space. It comprises a 300-metre long retail street, two Manhattan-inspired residences, four signature offices, two eight-storey corporate offices, two high-rise office towers including Menara Multi-Purpose, a four-storey mall and an entertainment complex. The properties are attracting investors due to its appeal and location. In January, Union Investment Real Estate AG, one of Europe's leading real estate investment management companies, had signed a deal with BRDB to acquire a high-rise office tower (Tower 2) for RM440 million. Tower 2, which is scheduled for completion by 2010, is a 41-storey Grade A office building with nett lettable area of 600,000 sq ft. Meanwhile, BRDB is expected to do better this year, thanks to higher property sales and effective cost management. For the first nine months of its current fiscal year ending December 31 2008, BRDB posted a net profit of RM60.7 million from RM46.5 million last year. Revenue was RM709.1 million, up from RM513 million, thanks to sales of properties at CapSquare, One Menerung in Bangsar and Troika in Kuala Lumpur. There are signs that deteriorating economic conditions have begun to hurt the construction industry despite the Government’s injection of an additional allocation of RM7bil into the economy. This is indeed worrying for the industry as it continues to deal with eroded profit margins, escalating costs and diminishing of projects. A main issue affecting the construction industry has always been the problem of delayed as well as non-payment. Partly because of the complexity of construction work and partly because of financing issues, there are bound to be disputes relating to non-payment. Remedies such as suspension of work and direct payment are difficult to be properly and lawfully exercised unless there are expressed provisions in the contract and the disputes are resolved by an independent third party. What is needed is an avenue where dispute resolution methods can be quickly effected and are affordable. More importantly, the disputes must be resolved quickly as and when they happen. Existing dispute resolution mechanisms in the construction industry such as arbitration and litigation are time-consuming and are often expensive. The arbitration or litigation process normally takes two to five years or longer to be resolved and costs tens or hundreds of thousands of ringgit which will further eat into contractors’ already thin margins. In fact, arbitration and litigation often take a long time because a detailed meticulous fact-finding process is required since the decisions are final. Another issue is that most standard terms in construction contracts stipulate that arbitration can only commence after the project is completed or terminated. This may be due to the fact that prolonged arbitration or litigation during the construction stage can be very disruptive. As a result, cash flow of contractors will be affected and this will inevitably affect the progress of construction. Consequently, innocent third-parties, such as the purchasers, are often the victims of delayed or abandoned projects. The existing related statutory laws such as the Contracts Act 1950, Sale of Goods Act 1957 and Arbitration Act 2005 can be applied generally and are not efficient enough to deal with current problems. To address the problem, various recommendations were made during a construction industry roundtable in June 2004 which was chaired by the former Works Minister Datuk Seri S. Samy Vellu. One recommendation was for the creation of a Malaysian Construction Industry Payment and Adjudication Act (CIPAA). # Building and Construction Industry Security of Payment Act 2004 (Singapore). All these countries recognise that timely payments are vital to the very survival and continuity of business of the construction industry. Clients are under contractual obligation to pay contractors, within the stipulated period, for services rendered and issuance of certificates of payment. The construction industry has been waiting for far too long for the Act to be in place as it has been more than four years since CIPAA was mooted. In fact the draft for CIPAA was circulated for comments early last year. Based on the feedback, certain parties have some strong reservations on the proposed Act. It must be stressed that they are not the main players who are being aggrieved in this regard. The Act should be seen as vital to protect the interest of the primary players in the construction industry and more so when the contractual bargaining powers of the primary players are often not equal. It is understood that the proposed CIPAA is now awaiting submission to the Cabinet for approval and directive so that a formal Bill can be presented to Parliament. 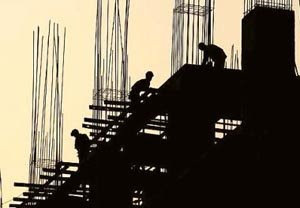 MBAM, therefore, urges the Government to facilitate the speedy enactment of CIPAA as the Act will help contractors across the board from G7 to G1 to survive during this difficult period where banks may adopt more prudent lending policies and the overall expected outlook for 2009 does not seem rosy. The Act would provide some relief if contractors are assured or given some security and remedies in the key issue of payment. Without any security of payment and quick justice through adjudication, the unpaid party either suffers in silence or is put out of business at the end of the current dispute resolution through arbitration or litigation. In conclusion, the problems on payments in the construction industry as identified above cannot be effectively resolved contractually thorough provisions in the standard terms of construction contracts. The most effective solution is, therefore, to enact a separate and specific Act of Parliament to address the problems. MBAM sincerely hopes that the Government and all parties concerned will work together to get CIPAA enacted in the soonest possible time for the benefit of the industry. KUALA LUMPUR: The Real Estate and Housing Developers Association (Rehda) Selangor has urged the Government and developers to work together in getting to the bottom of the Bukit Antarabangsa landslide. “The Government shouldn’t jump the gun in restricting hillside development while developers should cooperate with the authorities and offer a helping hand in search and rescue efforts,” said branch chairman Datuk FD Iskandar Mohamed Mansor. He was commenting on the Government’s call to review all existing developments near highlands following the landslide on Saturday. “Various parties have offered explanations for the cause of the landslide. “But as long as we don’t have a technical report on the incident, let’s not speculate,” Iskandar said. The association would email its members feedback regarding their hillside projects. But for now, people should offer their sympathy to the landslide victims and not point fingers, he said. Housing developer Datuk David Kong Hon Kong said issuing a stop-work order on all hillside development was not fair to developers. “It is fine for local governments to penalise developers who do not comply with regulations. “But it is unfair to pull the plug on other developers who have already obtained approval from the authorities. “Imposing a blanket ban on such projects would also reflect negatively on the nation’s construction sector and erode the confidence of investors,” he said in an interview. He said the Government needed to step up monitoring at construction sites to avoid any mishaps. The local authorities should also find ways to improve construction work at hillsides instead of closing down such development, Kong added. ASIATIC Development Bhd rose the most in a month in Kuala Lumpur trading after it was reported that the property developer is in talks with US mall owner Simon Property Group Inc for a project in south Malaysia. The stock climbed 6 sen, or 2 per cent, to RM3.06 at mid-day, headed for its biggest advance since November 10. A weekly reported on December 6 that Asiatic and Simon Property plan to build a RM2 billion (US$551 million) mall on a 50-acre (20 hectares) site in Kulai in Johor. MALAYSIAN planter Boustead Holdings will boost the size of the world’s first sharia plantation real estate investment trust to RM805 million (US$221.5 million), the firm said today citing strong demand for palm oil and Islamic banking products. Boustead’s plan to inject RM189 million of plantation assets into the REIT comes as property and palm oil markets struggle to cope with excess supply and a grim global economic outlook. Crude palm oil prices have fallen about two-thirds from their peak of RM4,486 set in March and the industry is cautious about prospects for a modest recovery next year. Rents of Asian properties, which were bolstered by robust demand as firms expanded, are forecast to slide next year as businesses slash costs to survive the deepening economic downturn. Still Boustead, which is also a financial and property firm backed by the Malaysian armed forces fund, said global demand for palm oil in the food and biofuel industries would underpin the plantations sector. “We believe that the price of CPO (crude palm oil) will improve towards the first half of next year,” Lodin Wok Kamaruddin, Boustead group managing director, told reporters. He said crude palm oil prices were expected to reach RM2,000-RM2,200 a tonne in the first half of 2009. Malaysia’s benchmark February palm oil contract was last traded at RM1,524 at 0718 GMT. Under the deal announced today, Boustead would sell two plantation estates to the Al-Hadharah REIT, bringing its asset portfolio to 16,420 hectares. Its holding in the REIT would rise to 337 million units or 60.5 per cent, from 53.4 per cent now. The sale would be paid through cash, the issuance of consideration units and lease of the plantation assets to Boustead Plantations Berhad, a subsidiary of the Boustead group. Boustead could inject more assets into the Al-Hadharah REIT later, Lodin said, adding that there could be plans for another REIT. Malaysia’s Islamic banking market has boomed in recent years, thanks to an aggressive government push and demand from the country’s mostly Muslim population. The global Islamic finance industry has weathered the US-led housing credit crisis relatively well, but bankers and regulators expect the sector to be hit as the economic downturn spreads. The US$1 trillion Islamic finance sector is based on sharia, or Islamic law, and advocates ethical investing and a fair distribution of wealth. Gains must not be made from interest-related investments or activities such as gambling and alcohol. MELBOURNE: Leighton Holdings Ltd, Australia's largest construction company, said it won a US$1.3 billion (US$1 = RM3.64) contract with its partners to build a new concourse at Dubai Airport. Dubai's Department of Civil Aviation awarded the contract to the Al Habtoor Leighton Group, Murray & Roberts Holdings Ltd and Takenaka Corp joint venture, Sydney-based Leighton said in an e-mailed statement. The concourse development, to be completed by April 2011, will include a four-star hotel and a five-star hotel.